With the summer sun heating up much of the country, there may be no more important reminder for your shoppers this week than this: Stay Hydrated. Most know that water is the beverage of choice when it comes to refreshing, and it’s interesting to note how this message has permeated the American mindset in recent years. 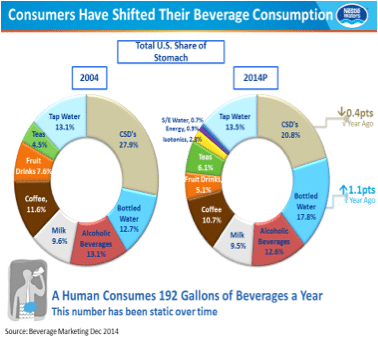 There has been dramatic change in American consumers’ beverage consumption habits in the last decade. Between 2003 and 2013, bottled water consumption increased 10 gallons per person per year, while carbonated soft drink consumption decreased 13 gallons per person per year, according to Beverage Marketing magazine. In 2014, bottled water consumption in the U.S. stood at 34.2 gallons per person. Consumption of tap water remained stable at about 13% of that total, as did consumption of milk at about 9.5%. Biggest increases in “share of stomach” beverage consumption during that ten year period: Tea, increasing from 4.5% to 6.1%, and bottled water, increasing from 12.7% to 17.8%. Largest drops in “share of stomach” beverage consumption: Fruit drinks, from 7.6% to 5%, and carbonated soft drinks, from 27.9% to 20.8%. Coffee consumption dropped slightly, from 11.6% to 10.7% and alcoholic beverage consumption declined from 13.1% to 12.6%. If current trends continue, bottled water consumption will exceed carbonated soft drink consumption in the U.S. for the first time in 2016. Bottled water is already the number one packaged beverage among 13 – 24 year old consumers and in the next decade, consumption is expected to be 1.5 times what it is today. Also keep in mind: Bottled water is the most affordable packaged beverage option, less than half the price of carbonated soft drinks. Bottled water is one of few products that allow shoppers to trade-up to a healthier product, at a lower cost. What does this mean for your store? Bottled water makes up 11% of all beverage revenue in retail and 30% of all beverage profits in U.S. grocery. It is number five in center store category profit dollars, after bread, snacks, cereal and candy. 5 billion cases of bottled water will be sold in 2015, according to modeled estimates. By 2024, that number is predicted to be 5.6 billion cases. The bottled water industry saw 4.4 million new sparkling water households in the last 5 years, and predicts 5.8 million new sparkling water households in the next 5 years*. New households will drive sparkling growth. As your shoppers gear up for the back-to-school season, “lunchbox duty” may be one of their more dreaded daily tasks. Pleasing little palates day after day, while also making sure that they are eating a nutritious meal that is portable and does not require refrigeration or reheating, is an ongoing challenge in many families. Try Bento Boxes: With different-sized sections perfect for all the nutrients kids need, these lunch boxes are all the rage. Fill the largest section with something hearty like pasta salad or rice and beans. The smaller sections can be stuffed with veggies and fruit, like sugar snap peas and peach slices. Add a Mini Babybel® Mozzarella Style cheese in the circular section and a couple of cherries in the other, for something sweet. For lunch pails or boxes, pack a PB&J on whole wheat bread, cut into triangles or squares. Add a serving of baked sweet potato chips, a Mini Babybel® Light and apple slices. Even little kids can help out with packing their lunches. Have them select crackers, sliced vegetables or fruit, and their favorite Mini Babybel cheese for a lunch that is especially appropriate for younger children. Think outside the typical sandwich staples. Switch out bread for rice cakes, pita or tortillas to put a twist on the standard turkey sandwich. When it comes to veggies, make sure the dips are tasty and fun. Try peanut butter, hummus or salsa to keep lunch packed with flavor. Kids love crunch. Instead of a bag of potato chips, try kale or apple chips. This pairs well with a creamy, fun-to-eat Mini Babybel® Original cheese. 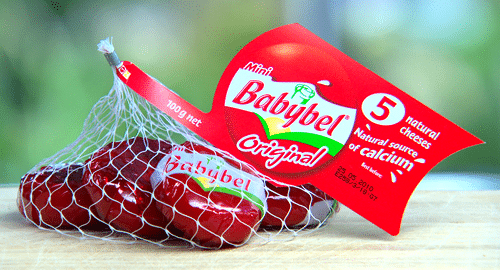 Mini Babybel is a 100% natural cheese with a unique, rich and creamy taste. Each serving of Mini Babybel provides at least 4 grams of protein and 15% of your daily calcium, all for 70 calories or less. The cheeses come in seven varieties, from classic Original to smooth Mozzarella Style. The individually portioned cheeses open with a simple peel of the red wax. ORIGINAL—Mild, creamy and delicious, Original goes with this, that and everything else! This 100% natural cheese is a good source of calcium and protein and always hits the spot at lunchtime, snack time and beyond. LIGHT—With 50% less fat than Mini Babybel® Original, Light is also unlimited on great taste. Because less fat doesn’t have to mean less enjoyment! MOZZARELLA STYLE—Mild, creamy Mozzarella style is perfectly bite-sized to become a new favorite. SHARP ORIGINAL— This is the mini cheese with huge ﬂavor; a natural cheese snack or lunch favorite that packs 5 grams of protein perfection in every bite-sized package. WHITE CHEDDAR VARIETY— Unwrap big, 100% natural cheese taste with this delicious White Cheddar variety. A hint of sharp and a bundle of creamy. GOUDA— Real milk and lots of love make up the creamy, nutty ﬂavor of Gouda. Not just for sophisticated palates, kids enjoy will it too. CHEDDAR VARIETY— This perfectly portable Cheddar variety is great in salads and sandwiches or as a snack all by its red wax-wrapped self. Posted July 29, 2015 by Shopping ForHealth & filed under News. Did you guess that we’re talking about an EGG? Researchers from Purdue University reported earlier this year on studies to determine if egg consumption improves absorption of carotenoids, like lutein/zeaxanthin, from raw mixed-vegetable salad. They fed sixteen healthy college-age men raw vegetable salad with either 10.5 or 18 g scrambled eggs. All salads contained the same amount of tomatoes, shredded carrots, baby spinach, romaine lettuce, and Chinese wolfberry. Carotenoid levels in blood ten hours later were 3-9 fold higher for various carotenoids when the men ate salad with 3 eggs compared to plain salad. And it was more than just lutein/zeaxanthin that increased. 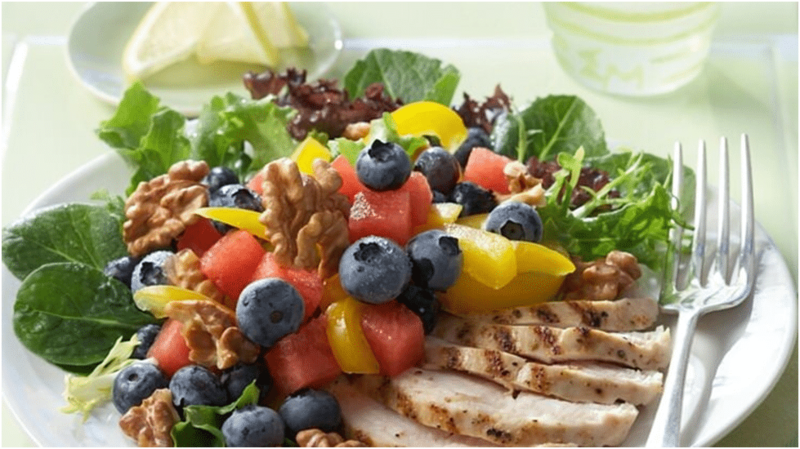 Carotenoids in the salad also include beta-carotene, alpha-carotene, and lycopene. And all of these carotenoids were absorbed better with the high egg salad. As a side note, you may have heard concern from your shoppers about a recent increase in egg prices. This is linked to Avian Influenza (AI), also known as bird flu, which hit the U.S. this year. More than 12 percent of the egg laying flock has been affected, making the supply of eggs tighter. However, eggs continue to be a very inexpensive source of high-quality protein – about 17 cents per serving. Preheat oven to 350 F. In medium bowl, beat eggs, milk, salt and pepper. Add cheese, zucchini, bell pepper and onion; mix well. Spoon evenly into 12 greased muffin cups, about ¼ cup each. Place in oven and bake 20 – 22 minutes. Remove from oven; cool on rack. Remove from cups and serve warm. Posted July 22, 2015 by Shopping ForHealth & filed under News. Looking for a lean, nutritionally beneficial and tasty meat to recommend to shoppers this summer? 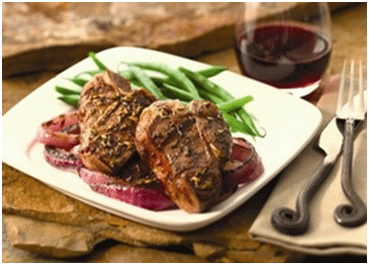 How about lamb, a good choice for anyone who doesn’t want to sacrifice flavor for healthiness. 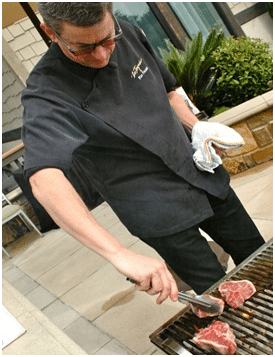 At the 2015 Shopping for Health conference, the Tri-Lamb Group, representing lamb producers in the U.S., New Zealand and Australia, hosted a grilling demonstration. We watched Ken Frank, a top Napa chef grill different cuts of lamb, and received purchasing tips and some fantastic recipe ideas. Lamb sold today has a delicious, slightly sweet flavor that pairs well with a variety of seasonings. It’s leaner, too, because of selective breeding practices and because the meat is trimmed of more excess fat before packaging. Lamb is available to meet a range of preferences-from natural or organic lamb to lamb that has been exclusively grass-fed or grain finished. There are five major cuts of lamb available in the US: shoulder, rack, shank, loin and leg. Most lamb is sold in supermarkets with fat trimmed to 1/4 or 1/8 inch. You can trim this thin layer of remaining fat before or after cooking. And why is it so good for you? On average, a 3-ounce serving of lamb is lean, has only 175 calories and meets the Food and Drug Administration’s (FDA) definition for lean. Lean meat has less than 10 grams of fat, less than 4.5 grams of saturated fat, and less than 95 milligrams of cholesterol per 100 grams or 3.5 ounces. The leanest cuts of lamb include those from the leg, loin and shank. Lamb is also nutrient rich, making it a natural fit for healthy diets. On average, it’s an excellent source of protein, vitamin B12, niacin, zinc and selenium and a good source of iron and riboflavin. In addition, lamb is available to meet a range of preferences—from natural or organic lamb to lamb that has been exclusively grass-fed or grain finished. In small bowl, prepare seasoning blend by combing black pepper, cayenne pepper, garlic, rosemary, parsley and salt. With paper towel, pat the lamb dry and roll in seasoning blend. Press mixture firmly into the meat. Refrigerate for 30 minutes. Remove from refrigerator, let warm up to room temperature. Preheat grill. In skillet over medium-high temperature, quickly sear chops in hot olive oil on both sides until light brown. Remove chops from skillet and place on grill. Grill to desired doneness. Remove from heat and serve. Posted July 15, 2015 by Shopping ForHealth & filed under News. Science continues to uncover the benefits of alpha-linolenic acid (ALA), the omega-3 essential fatty acid found in plant foods like soybeans, nuts and seeds. Omega-3 fats have been shown to help prevent heart disease and stroke, and they may help control lupus, eczema, and rheumatoid arthritis, as well as play protective roles against cancer and other conditions. Walnuts are unique among tree nuts in that they contain the highest amount of ALA. An ounce of dried English walnuts supplies 2.6 grams of ALA, and an ounce of black walnuts provides 0.6 grams of ALA. Walnut oil has 1.4 grams of ALA in each tablespoon, but does not contain dietary fiber. One ounce is about a quarter of a cup, or 12 – 14 walnut halves. A 2009 American Journal of Clinical Nutrition meta-analysis reviews the heart health benefits of walnuts on 365 participants from several trials. When compared with control diets, diets supplemented with walnuts resulted in a significantly greater decrease (-10.3 mg/dL) in total cholesterol and LDL “bad” cholesterol (-9.2 mg/dL). Walnuts also provided significant benefits for certain antioxidant capacity and inflammatory markers and had no adverse effects on body weight. Animal research published in the British Journal of Nutrition found a diet containing as much as 6 percent walnuts (equivalent to one ounce or 1/4 cup per day in humans) was able to reverse age-related motor and cognitive deficits in aged rats. A study evaluating the effect of dietary alpha-linolenic acid provided by walnuts and flaxseed on bone turnover found bone health improved with ALA consumption. This clinical research study was published in the January 2007 issue of Nutrition Journal. A Yale study published in Diabetes Care finds walnuts improve blood flow in adults with type 2 diabetes. Another study in the same publication reported a positive effect of a moderate-fat diet, inclusive of walnuts, on blood lipid profiles in patients with type 2 diabetes. The walnut group achieved a 10% reduction in LDL cholesterol and a greater increase in HDL (good) cholesterol levels than the other two treatment groups. A Nutrition and Cancer study investigated whether consumption of walnuts could affect growth of human breast cancer tumors (MDA-MB 231) implanted into mice. After 35 days, the breast cancer tumors of the walnut-fed mice were significantly less (2.9 ± 1.1 mm3/day) – about half the size of the tumors – than in the mice that were not fed walnuts (14.6 ± 1.3 mm3/ day). Researchers concluded that the results of this pilot study demonstrate that consumption of walnuts could slow the growth of cancers possibly by slowing the growth of tumor cells; however more research is needed before understanding its application to humans. Your one-ounce serving of walnuts provides benefits beyond the 2.5 grams of ALA, including being a top source of antioxidants (13.126 mmol), as well as providing 4 grams of protein, 2 grams of fiber and 10% of needed daily value of magnesium and phosphorus. But most U.S. adults have yet to discover the benefits of walnuts. Only 5.5% of all adults (ages 19-50) consume tree nuts of any kind! This small percentage of people actually do a pretty good job of integrating tree nuts (including walnuts) into their diet, and average about 1.25 ounces of tree nuts per day. But the other 94.5% of us report no consumption of tree nuts whatsoever. In a recent look at the nutritional differences between tree nut eaters and non-eaters, researchers have reported some pretty notable findings: on a daily average, tree nut eaters take in 5 grams more fiber, 260 milligrams more potassium, 73 more milligrams of calcium, 95 more milligrams of magnesium, 3.7 milligrams more vitamin E, and 157 milligrams less sodium! Preheat oven to 350º F and spread walnuts in one layer on baking sheet. Bake until just toasted and aromatic, about 8 minutes; remove and let cool. Posted July 8, 2015 by Shopping ForHealth & filed under News. Heading into or out of the heat today? What could be more refreshing than a tall glass of iced tea? And fortunately, it’s as good for us health-wise as it is tasty to drink. In fact, one of the best tips to give weight-conscious shoppers is a recommendation to substitute unsweetened iced tea for their favorite soda, including diet drinks. 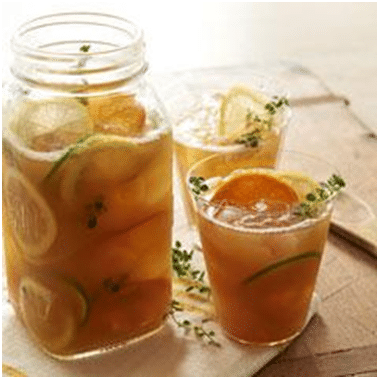 In fact, unsweetened iced tea is a fantastic addition to any meal, since it is tasty and easily paired with most dishes. Flavonoids are dietary compounds found in tea, wine, cocoa, fruit and vegetables. They contribute significantly to taste and color, and possibly help maintain certain normal, healthy body functions. A diet rich in flavonoids is generally associated with helping maintain normal, healthy heart function. Tea is the major contributor of flavonoids in the diet – 65.4 % of total flavonoids consumed by adults in the US are from tea.ᴬᴮ Drinking two to three cups of tea daily may help maintain normal, healthy heart function as part of a diet that is consistent with the Dietary Guidelines. Equally important, especially for the elderly and in this hot weather: Iced tea can serve as a hydration source. Unsweetened iced tea is 99.5% water making it a great drink to quench your thirst while still tasting delicious. You may have heard a myth that caffeine, from various sources including tea, causes dehydration. However, the level of caffeine in the amount of tea typically consumed has little or no diuretic effect.¹ In fact, fluid in the iced tea contributes to hydration. A cup of tea typically contains half the caffeine found in a cup of brewed/filtered coffee. Pour boiling water over Lipton® tea bags and brew for 2 to 5 minutes based on prep instructions. Remove bags. You can add citrus such as fresh grapefruit, orange, lemon or lime slices for a fruity twist, or stir in one teaspoon of star anise, cardamom, cinnamon, nutmeg or ginger for a spiced infusion. Chill or add ice. Add herbs such as rosemary, mint, lavender, sage, or basil for a hint of herb ﬂavor. Stir in remaining ingredients and chill until ready to serve. Serve in ice-filled glasses and sweeten as desired. ᴬChun OK, Chung SJ, Song WO. Estimated dietary flavonoid intake and major food sources of U.S. adults. J Nutr; 2007;137:1244-1252.
ᴄDuffy SJ, Keaney JF Jr, Holbrook M, et al. Short- and long-term black tea consumption reverses endothelial dysfunction in patients with coronary artery disease. Circulation. 2001; 104(2):151-156.
ᴰGrassi D, Mulder TP, Draijer R, Desideri G, Molhuizen HO, Ferri C. Black tea consumption dose-dependently improves flowmediated dilation in healthy males. J Hypertens. 2009;27(4):774-781.
ᴱHodgson JM. Effects of tea and tea flavonoids on endothelial function and blood pressure: A brief review. Clin Exp Pharmacol Physiol. 2006;33:838-841. ¹Gardner EJ, Ruxton CH, Leeds AR. Black tea –helpful or harmful? A review of the evidence. Eur Clin Nutr;61:3-18. Popkin BM, Armstrong LE, Bray GM, Caballero B, Frei B, Willet WC. A new proposed guidance system for beverage consumption in the United States. Am J Clin Nutr; 2006:83:529-542. Maughan RJ, Griffin J. Caffeine ingestion and fluid balance: a review. J Hum Nutr Diet;(2003):16:411-420. So Many Reasons to Love Strawberries! Posted July 1, 2015 by Shopping ForHealth & filed under News. Reason #1 – Strawberries are high in vitamin C (more than oranges) and may boost immunity. Reason #2 –Strawberries may reduce the risk of heart disease, according to studies. Reason #3 – Strawberries are considered a super fruit with loads of antioxidants. Reason #4 – Strawberries are grown by caring farmers who use sustainable farming practices. Reason #5 – Strawberries are nationally celebrated and voted America’s favorite fruit. Reason #6 – Strawberries are versatile and can be added to savory and sweet dishes. Reason #7 – Strawberries are vibrant and juicy for summer snacking and entertaining. Reason #8 – Strawberries are grown to perfection along the California coast. Reason #9 – Strawberries are loved by kids and ideal for back to school lunches. Reason #10 – Strawberries are ideal for adding appeal to holiday dishes and special occasions. Reason #11 – Strawberries are low in sugar, naturally sweet with only 45 calories per cup. Strawberries probably aren’t a hard sell to your shoppers since everybody loves them. What they may need is more ideas on how to serve. 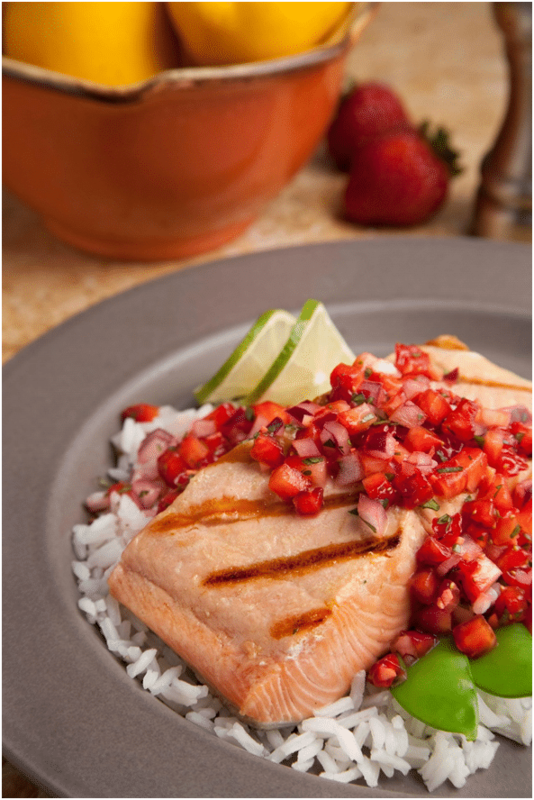 Here is a beautiful and tasty dish from the California Strawberry Commission, perfect for the summer days ahead. Coming This Week – The June Issue of the Shopping for Health Newsletter! Posted June 24, 2015 by Shopping ForHealth & filed under News. Supermarket dietitians, check your email this week for the summer edition of the quarterly Shopping for Health e-Newsletter. In this issue you’ll find lots of great materials and information, designed to help in your communications with shoppers. 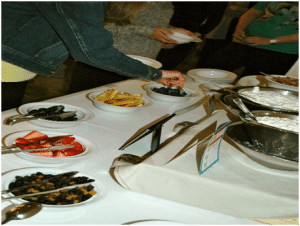 Everything you need to assist customers who are interested in plant-based eating, courtesy of the California Walnut Commission. There’s a get-started grocery shopping list, as well as handouts explaining how to replace saturated fats with monos and polys, nutrition information on walnuts, and some great recipes. 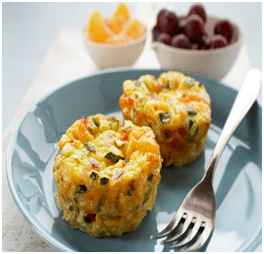 From Daisy Brand Cottage Cheese, shopper tips offering healthy snack ideas. Try these great pairing ideas to team Daisy all-natural cottage cheese with some tasty, nutrition-packed sides. Also, how to talk to shoppers about meeting protein needs with cottage cheese, and a complete guide to how to shop your store to meet MyPlate recommendations. Back-to-School handouts, news and stats from Mini Babybel Cheese. Check here for creative tips for the lunch bag or box as well as detailed customer fact sheets on the many flavors of Babybel Cheese. Social media and Tweet tips included! These recipes, photographs, social media ideas, nutrition backgrounders, customer handouts and more will be available in the Shopping for Health archives for up to one year. Make your life as a supermarket dietitian easier by visiting the content library and archives at www.shoppingforhealth.org! Who are America’s Top Snackers? Posted June 17, 2015 by Shopping ForHealth & filed under News. Cottage cheese is a snacking choice of 28% of “health conscious” consumers, according to research conducted by Daisy Brand Cottage Cheese. And with just four ingredients – cultured skim milk, cream, salt and vitamin A palmitate (an antioxidant added to dairy products to replace the vitamin A lost in production), Daisy Brand fills the bill for those looking for the most natural cottage cheese. Most other brands have ten or even more ingredients. Water – Pour it On! Posted June 10, 2015 by Shopping ForHealth & filed under News. Water is the most essential nutrient for life, but the U.S.D.A. dietary guidelines focus primarily on what to eat, rather than what to drink. And as a result, too many people drink sugar-sweetened beverages instead of water. Twenty percent of our daily calories – and nearly half of all added sugars – come from beverages, according to recent national nutrition survey data. Half of all children and adults say they drink at least one sugar-sweetened beverage a day. American Heart Association – Limit the consumption of sugar-sweetened beverages to 450 k calories (36 ounces) per week, for a 2000 k calorie diet. American Academy of Pediatrics – Water, not sports or energy drinks, should be the principle source of hydration for children and adolescents. 100% fruit juice should be limited to 4 – 6 ounces per day for children who are 1 – 6 years old, and 8 – 12 ounces per day for children and teens who are 7 – 18 years old. World Health Organization – Limiting intake of free sugars to less than 10% of total energy is part of a healthy diet. A further reduction to 5% or less is desirable for additional health benefits. Sugar intake can be reduced by limiting the consumption of foods and drinks containing high amounts of sugars. As we move into the hot summer months, adequate water consumption is more important than ever. 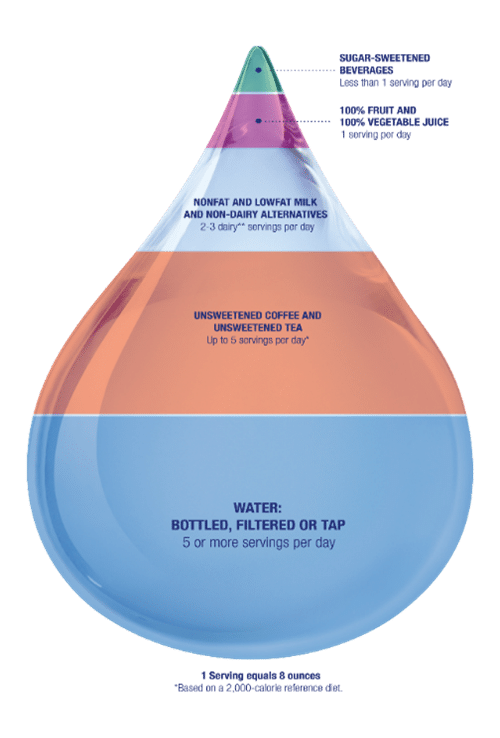 From Nestle Waters USA, here is a visual guideline to use when talking to consumers about how to best structure beverage consumption, to provide the hydration needed each day. Recommendations are based on a 2006 Journal of Clinical Nutrition study, and USDA data. ᴬ Popkin BM, Armstrong LE, Bray GM, Caballero B, Frei B, Willett WC. A new proposed guidance system for beverage consumption in the United States. American Journal of Clinical Nutrition. 2006; 83:529-542.
ᴬU.S. Department of Agriculture and U.S. Department of Health and Human Services. Dietary Guidelines for Americans, 2010. 7th. Edition, Washington, DC: U.S. Government Printing Office, December 2010. Available at: http://www.cnpp.usda.gov/sites/default/files/ dietary_guidelines_for_americans/PolicyDoc.pdf.